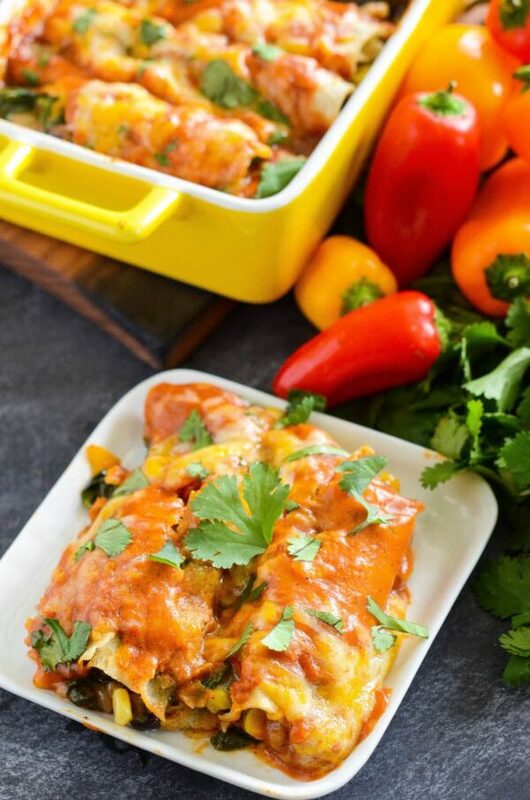 Vegetable Enchiladas: cheesy vegetarian enchiladas are stuffed with tons of vegetables and are wrapped in a flavorful five minute homemade enchilada sauce! This vegetarian enchilada recipe is really easy to make and has loads of flavor that the whole family will love! I like to stuff ours with bell peppers, corn, onion, black beans, spinach and a TON of cheese! Then we whip up a super quick homemade enchilada sauce that is really easy and loaded with flavor. Pop them into the oven and they are ready to go! If you are looking to learn how to make homemade enchiladas, this is a great starter enchiladas recipe. 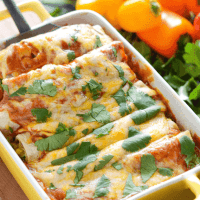 I have actually been making these healthy enchiladas for the past 5 years and we all love them — including the kids! They are loaded with tons of vegetables and cheese…so how could they not be good? I have really perfected the recipe and thought they really deserved to be shared again with new better pictures. You can see the old post right here! Boy were those photos were epically bad! To keep these enchiladas fully vegetarian, make sure you use a vegetable stock versus a chicken stock in the homemade enchilada sauce. As for the cheesy vegetable filling, I use a variety of vegetables and am always switching it up for new versions. In the recipe below, you will find bell peppers, corn, onion, black beans and spinach. However, I have also used zucchini, riced cauliflower and yellow squash. The options are endless and the flavorful red enchilada sauce recipe works great with all vegetable combinations! In this recipe, you are going to see that I call for Adobo seasoning. I know not everyone has this stocked in their pantry or even knows what it is. Adobo seasoning is a mix of salt, garlic, oregano, black pepper and turmeric. It’s a stable in many Spanish homes. If you don’t want to buy an extra seasoning, you can just use extra salt (to taste) in it’s place. However, I totally love Adobo seasoning and always find 100 million ways to use it. Even just to season chicken! But then again, my husband is Puerto Rican, which makes it a must have seasoning in our house! Make sure that your tortillas are warmed (if using traditional corn tortillas). Otherwise they can crack when you roll them. To warm your tortillas, wrap them in a slightly damp paper towel and microwave them for about 20 seconds. Also, prepare your sauce before starting and make sure you add sauce to the bottom of your casserole dish before adding the enchiladas. You don’t want those delicious tortillas to stick to the bottom and have the filling fall out! It’s hard to believe I have been sharing recipes with all of you since 2008! That feels like forever ago now. In that time I have brought you a few other homemade enchiladas recipes that you may be interested in. For a more classic white enchiladas recipe, check out these Salsa Verde Sour Cream Enchiladas. 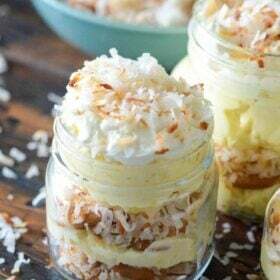 They are truly epic and are one of the most popular recipes on my site! 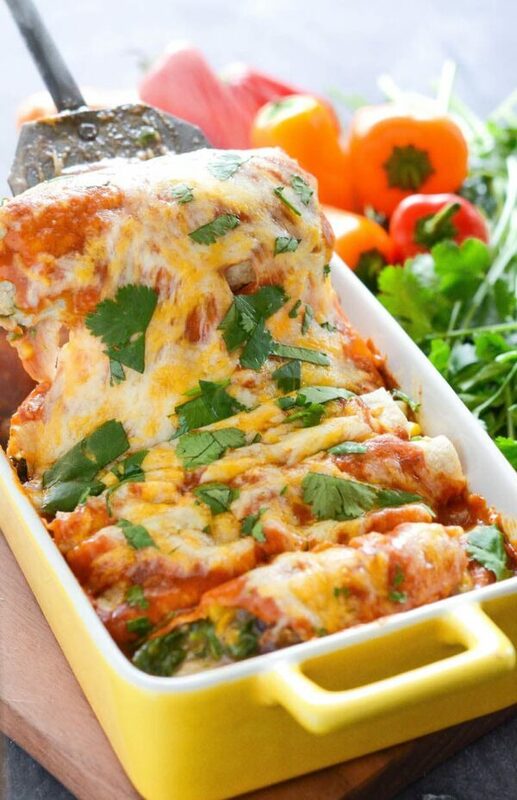 For a fun twist, you can try these Buffalo Chicken Enchiladas. They are very unique and loaded with flavor. Long story short, these are truly the best vegetarian enchiladas I have ever made — and I have made many of them! 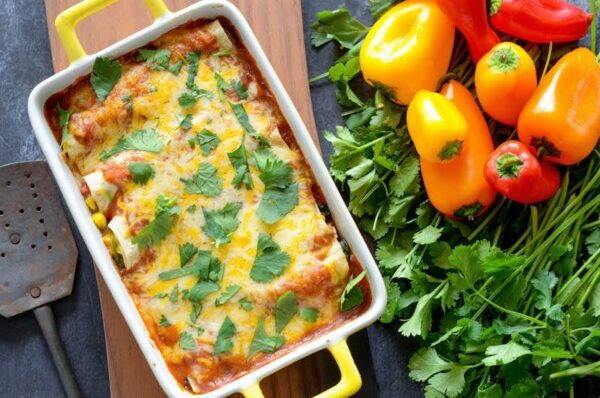 I can’t wait to hear all your reviews of this recipe for the Best Vegetable Enchiladas! These cheesy Vegetable Enchiladas are truly the best, with their flavorful homemade sauce made in just 5 minutes, and loaded vegetable and cheese filling! In a medium saucepan, heat olive oil over medium-high heat. Add cumin, adobo, garlic powder, white pepper, coriander, black pepper, flour, and tomato paste. Cook, whisking constantly, for 1 minute. Whisk in the broth and bring to a boil. Reduce to a simmer and cook until slightly thickened, about 5 minutes. Set aside. In a large skillet, heat olive oil over medium-high heat. Add garlic, onion, bell pepper and corn and saute until just softened. Stir in adobo, cumin and black beans. Preheat oven to 375°F. Lightly spray a 9x13 baking dish with non-stick spray. Pour 3/4 cup sauce in the bottom of the baking dish and spread evenly. Sprinkle remaining cheese evenly over the enchiladas. Bake uncovered until hot and bubbly, about 20 minutes. Cool for 5 minutes before serving and sprinkle with extra cilantro. Serve hot! If you want to make these but only have two adults in your household, like me, then freeze half a batch! When I make these, I buy some of those throw away foil pans and separate them in 2 or 3 batches. To freeze, complete all the steps until it's time to bake them. Then freeze them instead! When you are ready to eat them, bake them frozen and expect it to take about double the time to bake as the recipe says since they are frozen. Hi Jessica. Do you think you could use the canned adobe peppers in the sauce instead of the adobe seasoning? I have some frozen right now just waiting for the right recipe. Would love to use them up. Hi Roberta! Adobo seasoning weirdly enough is not made from an adobo pepper, it is actually a “seasoned salt” with things like garlic, oregano, black pepper and tumeric. And then just add extra salt in place of the adobo seasoning – taste as you add to make sure it doesn’t get too salty on ya! Hope you enjoy them and please report back how it goes! Hi Jessica. I went ahead and made these with the canned adobe peppers. After getting it all together and giving a taste I realized how SPICY the sauce was so I ended up using another cup of broth to thin out the spiciness. They were delicious with the canned peppers, although in the future I think I’ll get the adobe seasoning since my daughter isn’t a huge fan of spicy. Great recipe either way!! Congrats on your 8 year anniversary too! Wow! This dish looks wonderful – and your photography is amazing, too! 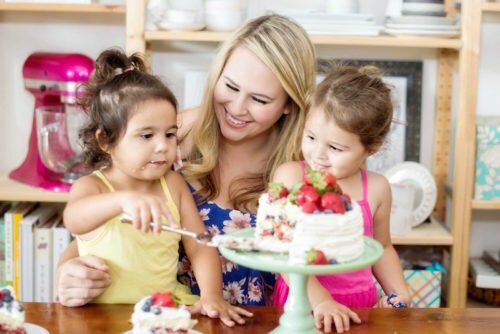 Congrats on blogging for 8 years – that’s a real accomplishment! I’m sold. These look amazing!!! I really need to start making enchiladas. I know my family would love them. Great recipe and perfect for 5 de Mayo! 8 years?! Wow. Congratulations! And so happy you’re sharing these again. They look amazing! WOW – these are perfection! Love the veggie version – pretty photos too! 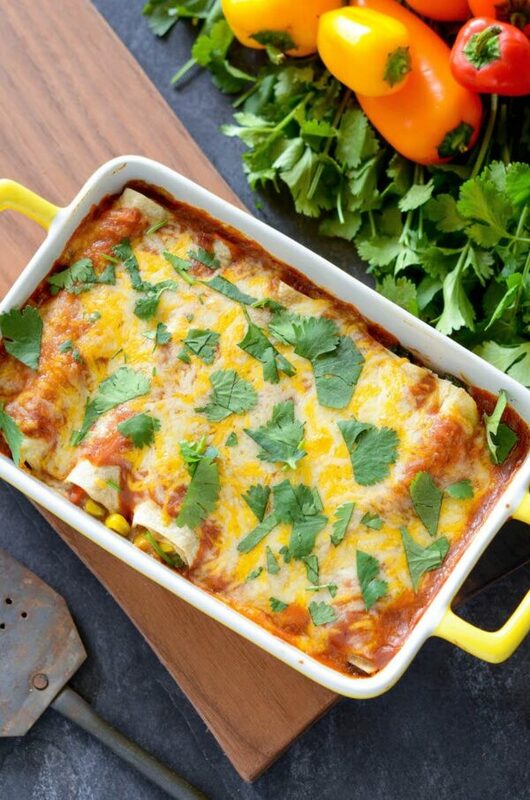 I like the addition of corn to these enchiladas for a sweet little crunch. 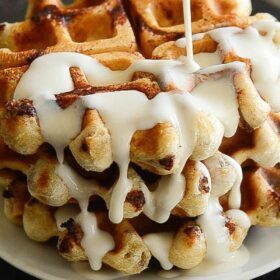 I am totally making these to stock up my freezer. 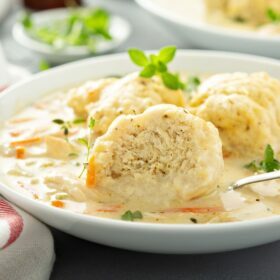 I’ve been on the hunt for great freezer friendly meals, and I know these will be awesome! I love stocking my freezer with enchiladas! These are too good to resist. I definitely need to add them to my dinner menu soon! 8 years?! Congrats! That’s so exciting! These enchiladas look amazing, and I love that they don’t have any meat in them 🙂 Plus..adobo seasoning is pretty much amazing. Making your own sauce makes all the difference when you’re making enchiladas! These look like a great idea for a weeknight dinner. Congrats on 8 years, Jess. 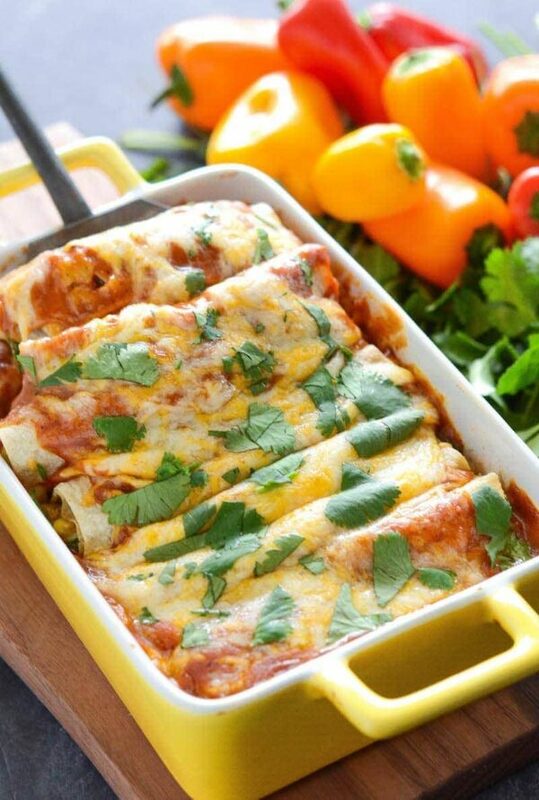 LOVE these enchiladas, specifically that they are vegetarian! These enchiladas look so great! My kids will love this! I’m with Lauren L., so glad to find the perfect veggie enchi recipe. They’re not all created equal and you can’t just toss any old veggie into the mix. These look awesome! I made these on Sunday and they’re a huge hit! I love that the enchilada sauce was made from scratch and has such great flavor. I used hatch chile flour tortillas from HEB instead of the corn tortillas and it turned out great. The enchiladas also make great leftovers. Thanks for the recipe! I think I will use flour tortillas instead. It seems more logical. Flour tortillas become soggy in enchilada sauce. That is why true Mexican enchiladas are made with corn tortillas. However, feel free to use whatever you would like! Hi looks delish but I’m Jamaican and can’t get adobo seasoning here. What can I use instead. Any other poultry seasoned salt would do. Or something like garlic salt. My first time making enchiladas and using this recipe, it was a total success! Thank you for the great ingredients and straight forward instructions. We didn’t have adobo seasoning so I substituted with a paprika, chili powder, oregano, garlic powder and cumin. Tasted awesome. Going to become a regular at our dinner table! This was delicious! I made it tonight but cut the recipe in half. I always have 8 inch flour tortillas in the house and the half recipe filled 7 tortillas with just under 1/2 cup mixture for each. I like this one better than the chicken enchiladas. The sauce is so much better than the canned enchilada sauce! It is definitely a keeper! Thank you for sharing this on Pinterest! Is there an alternative method I could use to heat the tortillas quickly before adding the filling instead of using the microwave? We don’t own one. Hi Jackie, you can also heat them using a skillet. Or you might not need to heat them at all. Some people find their tortillas fold just fine without heat. If yours start cracking though, just heat them up in a skillet as you go. This recipe sounds wonderful. I want to make for company this week because I need a vegetarian dish. Two questions: could this be made ahead of time and then baked and also could I use frozen, chopped spinach thawed and squeezed dry? Thanks again. First, the easy question, yes you can use frozen spinach as long as you cook it first and squeeze out all the extra water! And secondly, I sadly haven’t tried freezing this recipe yet. I believe it would work ok, but don’t know 100%. If you do want to try it, I would recommend assembling them completely and then freezing them before baking. Remember, when you do bake them, they will take about double the time to bake from frozen. I made this recipe a few weeks back and it is now part of my regular recipe rotation. My husband has declared that it is his favourite meal ever!! We just love it! We especially love that it makes enough to freeze for future meals. We give it 5 out of 5 starts :). These are delicious!! I am eating them while typing this!! 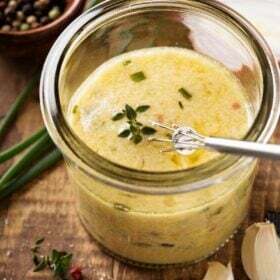 The sauce is awesome…I will never buy the canned stuff again, as it was easy to make. I questioned the 16 oz of spinach, but as I should have realized, it wilted down a lot. The only thing I will do different next time is wilt the spinach first, and set it aside….my pan’s not big enough!! They are filling, but light. Even my carnivorous hubby loved them. 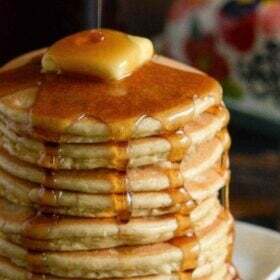 Will definitely make these again!! Awesome! So glad you love them! 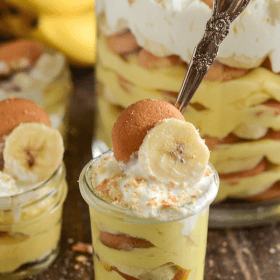 This recipe is incredible!! I’m making them right now and it is probably my 10th time making them. Definitely one of my go to recipes now!